Along with red dot sights and mounts, spare magazines are great additions to your 6.5 Creedmoor. They can drastically affect the length of time in which you can be in the field or on the firing range and allow you to take on more than one target at the same time. Spare magazines can provide greater peace of mind and will let you remain mobile and effective, no matter what the tactical situation is at the time. They're flat benefits to your tactical kit with hardly any drawbacks besides their minimal extra carry weight. Why Do I Need Spare Magazines? Carrying a spare magazine or two is a good idea for a number of reasons. Let’s go over some of the primary benefits that you can get by carrying extra magazines. The worst thing that can happen in the middle of a tense situation or firefight is for you to run out of ammo. If you have a spare magazine, you can immediately replace a jammed or malfunctioning magazine and get right back into the fight. Having more rounds is never a bad idea. This is especially important if you have to take on more than one opponent at once. If you’re on the firing range, extra magazines allow you to prolong your accuracy training. If you ever have to take on two targets at once, or even more than two, having spare magazines dramatically increases your ability to successfully defend yourself. What Makes These Magazines Stand Out? We’ve established that having spare magazines is a really good idea. But what makes these particular magazines worth your time and money? Let’s go over the primary aspects that you should focus on when looking for a good spare magazine for your 6.5 Creedmoor. Many great magazines are finished with black nitride or some other coating that can reduce both friction and lifetime corrosion. Magazines that have a good finish will last longer and operate more smoothly than magazines that are just manufactured from their base metal. Good magazines will obviously have plenty of space to store rounds, and magazines that are able to store the maximum amount of ammunition without compromising their ability to feed rounds into the rifle are your best bet. Beware of magazines that have an outlandishly high ammunition capacity, as this might be indicative of poor craftsmanship or crowded space that doesn’t allow for easy round feeding. Try to invest in magazines that are tough and weatherproof, even if they're more expensive up front, because you'll save money in the long run when you don't have to buy more magazines just because they were dropped on the ground. Above all, make sure that the magazines you purchase can feed rounds into the rifle very smoothly and without jamming. Since this directly affects the primary purpose of a spare magazine, it’s the most important thing to consider. Now that you know what to look for, let’s go over our favorite 6.5 Creedmoor spare magazines. We’ll explain what makes each one worthwhile. This is one of the best spare magazines we've ever seen. Right off the bat, you get a lot of personal choice depending on how many rounds you want your magazine: you can select 5 rounds, 15 rounds, or 20 rounds, depending on your preference. This allows virtually anyone to have use for this particular style of magazine. These magazines have also been coated with a Parkerized finish, preventing corrosion and minimizing friction. Having this kind of coating adds a lot of value to the purchase. That’s not all it has; the magazines each come with a precision spring that makes loading rounds into your rifle very smooth and virtually jam-free. You can remove the floorplate during any cleaning or maintenance, which is a great design choice that we hope to see repeated with magazines in the future, both from this manufacturer and others. The magazines are designed to be mil-spec, so if you’re going for military aesthetic with your own rifle or tactical kit, you’ll love this design choice. These magazines are very tight, so you might have to put a little more effort into their removal, as they’re not free drop. This is a minor flaw in a very excellent magazine. These magazines come with three different capacities depending on your needs and are all finished with a special coating that can reduce friction and corrosion. The magazines excel at smoothly loading ammunition into your rifle and have a removable floorplate for easy cleaning. 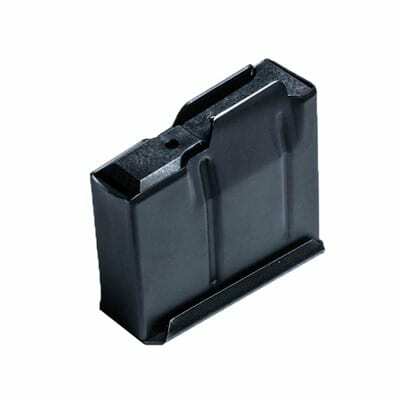 This magazine can carry 10 rounds in total and looks extremely sturdy and durable right from the get-go. It’s very easy to grip from the bottom, as it is designed with a flared base that makes it easy to rub your fingers all the way around. The magazine is made of a hardened polymer but it nonetheless lacks a coating finish to reduce friction and corrosion. Aside from that, this magazine is a really great pick. It’s extremely durable despite the lack of a coating and can feed rounds into your rifle with extreme reliability. This is because of the great spring placement and good overall size, which is pretty great for 6.5 Creedmoor rounds. It’s also a pretty affordable magazine, which is nice since 10 round magazines can sometimes escalate in price drastically. It’s a really solid, general option if you need a 10-round magazine that looks and feels fairly sturdy without breaking the bank. 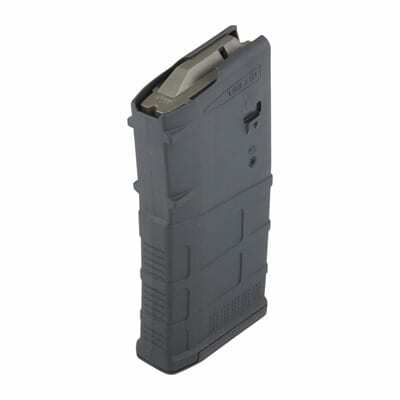 This magazine can hold 10 rounds and is easy to grip and insert into your rifle. It lacks a coating finish, but the easy loading and rough aesthetic elevate it beyond this small flaw. This is another versatile magazine choice where the ultimate decision about how many rounds the magazine can hold is up to you. You can choose between 5, 10, or 12 rounds depending on your preference. Each magazine is totally made of steel regardless of how many rounds you specify. This gives all the magazines a great lifespan and excellent durability even under heavy use. Guiding the magazines into your rifle is very fluid and you’ll find that the spring mechanism works very well no matter which size of magazine you purchase. There isn’t a coating or finish beyond the general black layer of paint, but the steel itself is durable enough that we didn’t think anyone would have much trouble when it comes to the lifespan of these magazines. There is a small nitpick in that certain sizes of rounds might need to be shaped down or otherwise modified to fit into the magazine. This is because of the overall shape and design of the magazine, which is somewhat limited and narrow. If your rounds will fit into this magazine, it’s a great buy based on the value you get per dollar. 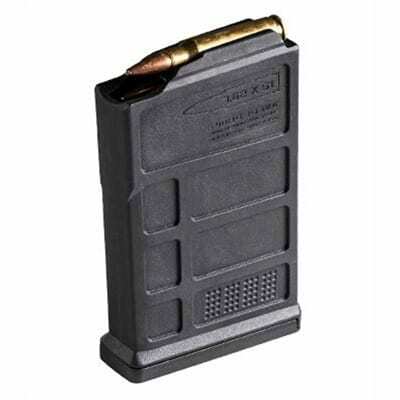 This magazine can hold three different ammo capacities depending on your needs, and each type is made of durable steel. Its interior is somewhat narrow, so larger rounds may need to be sized down or modified to make them fit perfectly. Now we’re getting into the higher capacity magazines. This magazine can hold up to 25 rounds, which makes it an excellent choice if you tend to spray a lot of lead or if you don’t want to run the risk of ever running out. It’s not built for fully automatic action, though, so avoid using this magazine in tandem with full auto weapons. There’s a handy window integrated into the side of the magazine that can allow you to see the current capacity if you lost track of how many rounds you fired. It’s not an exact number by any means, but it’s better than totally guessing and can give you a general picture of how long you have before you need to reload. 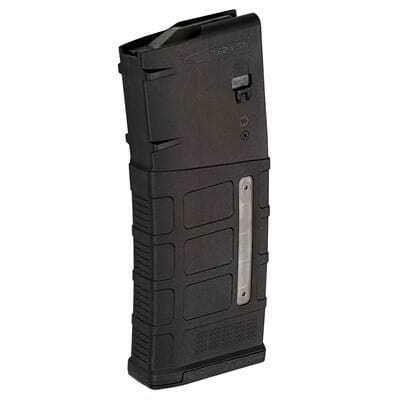 The magazine is made of a durable polymer that’s built to last for quite a long time and has ribs along the side to allow you to easily grip it for insertion or removal. It does lack a coating finish to preserve it over time and reduce corrosion, but it’s so affordable that we think that its pros vastly outweigh its cons. 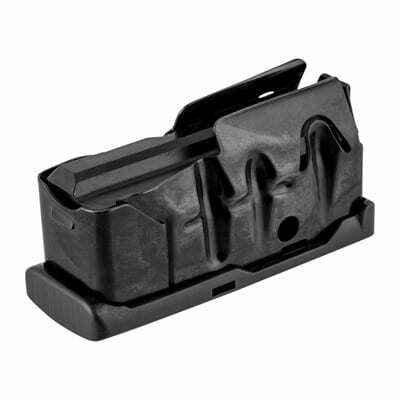 It’s a great choice if you’re looking for a general high-capacity spare magazine for your 6.5 Creedmoor. This magazine can hold 25 rounds but isn't rated for full auto. It is rather intended for semiauto action and meant to support a great deal of shooting. There's a window installed in its side that can let you see how many rounds you have left. It's made of a durable polymer that is easy to remove and insert. On the flipside, here we have a magazine with a much lower capacity, five rounds to be exact. 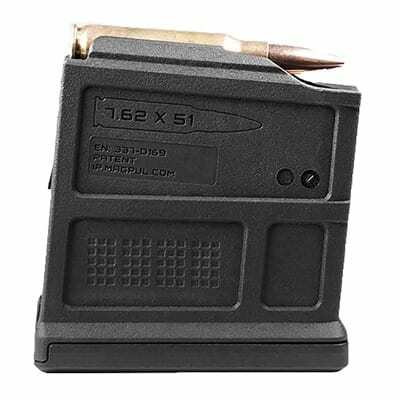 While this might be perfect for some shooters, this low capacity is definitely going to be a downside for others, considering that most people get a spare magazine to increase their bullet count by a significant margin. Aside from the low capacity, it’s a very well-made magazine. It’s made from a durable polymer that’s extremely easy to grab ahold of because of the flared base; inserting or removing the magazine is easy even though it’s relatively small. Because the magazine is so small, you’ll also be able to carry more of them on your person at one time, although you could similarly just use a higher capacity magazine to achieve the same effect. Modifying the magazine for higher capacity is actually quite easy. But although it’s very well-made and it feeds ammunition into a rifle with smooth regularity, the price isn’t low enough to justify the time and financial cost needed to increase its capacity in any meaningful way. This is limited to being the best pick if you’re going for small magazines in particular. This low capacity magazine is perfect if you only want a few extra rounds for your 6.5 Creedmoor, and is made with a high-quality polymer. The magazine can be modified to take more bullets, but you might be better off simply buying a higher capacity magazine. In a similar vein, this magazine can carry four rounds in total and is extremely lightweight, despite its steel construction. Because of its light weight, you can definitely carry many more of these magazines than you might be able to carry normally. This magazine is made of extremely strong steel and shaped such that stacking them or bundling them into containers or pockets is convenient and achievable. The interior is also shaped such that you can fit several different kinds of cartridges right out of the box. This kind of functionality might be advantageous if you’re trying to use the same magazines for a few different types of ammunition, or if you fire different weapons depending on the hunt. In that case, the round versatility offered by the magazine is definitely an aspect in its favor. 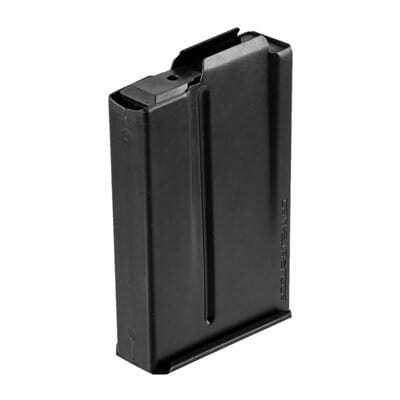 This low capacity magazine is shaped very well and can carry several different types of rounds without any modifications on your part. Each magazine is lightweight but made of sturdy steel that isn't liable to falter under duress. You can carry many of these magazines more easily than you could larger magazines. Now we can head back into magazines with a more conventional capacity. 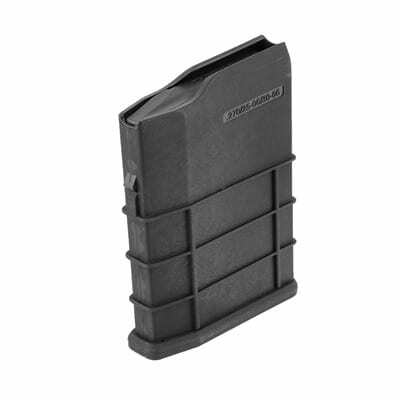 This magazine can hold 10 rounds in total and is made from steel coated with black oxide. This coating provides the magazine's steel construction with the ability to resist corrosion and friction beyond that of its natural properties. Lower friction is a great quality to look for spare magazines, as it directly impacts how easy it is to remove and insert a magazine in the heat of the moment. This magazine, therefore, has an extremely smooth drop and even feels smooth to the touch. There are some folks who really prioritize magazines that feel fluid and that they can practice quick reloading with regularly. If you’re trying to look for magazines that allow you to drop empties and load fresh magazines very quickly, this is a great place to start. This magazine is a little pricey, but given the exceptional construction, we think it's a good pick if you're looking for quality more than a budget choice. There's no doubt that you'll get your money's worth with this kind of superior magazine. This magazine is made from steel that has been coated with black oxide, which allows it to resist corrosion more than normal and remain extremely fluid and smooth as it is dropped and inserted. It's a great magazine for hyper-fast reloads or if you plan to switch magazines very quickly in a tense moment. It does cost a little more than its competitors for the benefits granted by the oxide finish and smooth construction. This is another 10 round magazine that’s made from polymer and has a relatively unique aesthetic design, which you’ll see right out of the box. This magazine does lack any kind of coating or finish, but it’s tough enough that we think most people won’t have any issue in spite of this. This magazine is easy to grip and pull thanks to the lines that are raised on all sides of the magazine. This gives it a rough, tactical feel that some folks will really like because it can fit with a lot of modern pseudo-military aesthetics. The magazine is also really easy to load into a rifle, despite the shape of its top. Rounds are fed very smoothly into the rifle, although we again recommend that you be careful with certain nonstandard round sizes, as the interior of the magazine is very narrow and strict. Some modifications may be necessary if you plan to introduce nonstandard rounds into the magazine. This magazine is made from a durable polymer and lacks a coating finish. However, it’s a reasonably priced alternative to some mil-spec magazines and loads very smoothly upon insertion. You may need to be careful with nonstandard ammunition types because of the shape of its top and interior. Now we will go up in capacity once again. This is a 20-round magazine that’s made from a thick, matte polymer that looks as tough as it feels. 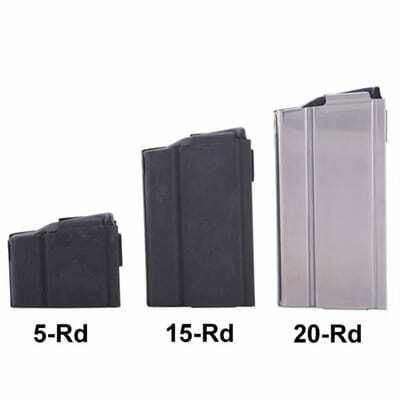 Because of the high-capacity, it’s a little heavier and larger than other standard spare magazines. It’s also not rated for full auto firing, so restrict your usage of this magazine to semiautomatic shooting. Loading this larger magazine is actually quite easy, thanks in part to its good shape design and well-made loader spring. You’ll be able to use standard size rounds with no difficulty to its full capacity so long as you load each round carefully. The length of the magazine is ribbed and is therefore easy to grip for dropping or inserting. Since it does lack finish, it’s not as lubricated or fluid as some of the other magazines we’ve reviewed, so it’s not ideal for reloading as quickly as possible. 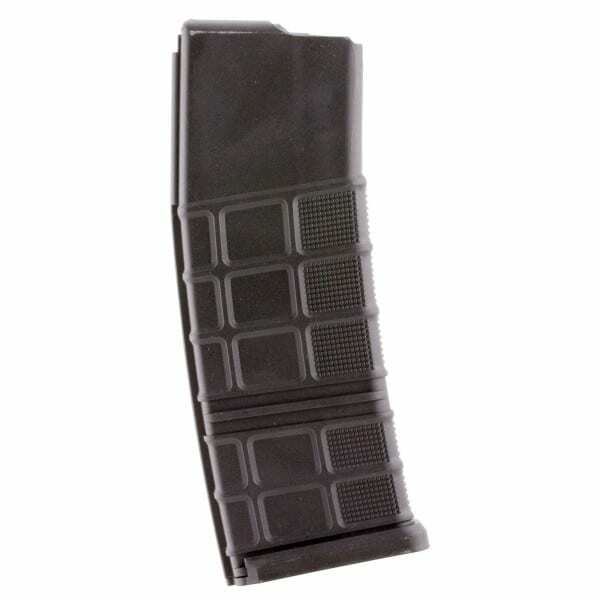 This magazine is a high-capacity model made from a sturdy polymer and which possesses an efficient load spring and a great grip that makes inserting or removing the magazine very manageable, even under high-stress situations. The magazine is a little larger and heavier than you may be used to, especially in comparison to standard size magazines. Finally, let’s take a look at this ultra high-capacity magazine, which can carry a grand total of 30 rounds. This is one of the highest capacity 6.5 Creedmoor magazines we’ve seen. It’s made from a lightweight, glass reinforced polymer that keeps its overall weight lighter than a lot of high-capacity magazines while retaining an upstream to compete with total steel magazines. The magazine is also built with chrome silicon springs, which are extremely adept at loading ammunition into your rifle with amazing speed and fluidity. This makes it a great pick if you are going to be shooting a lot of lead downrange or are particularly averse to the possibility of a jam. In fact, we really like that each new round is fed so fluidly into the rifle because it lets you take advantage of the higher capacity to its full extent. You'll almost feel like you never run out of ammo when the rifle really gets going since it can seem like it takes forever to finally run dry. There's no getting around the fact that this magazine is a little bulkier than a lot of the other products on this list, meaning that if you're considering this magazine, you need to consider the trade-off. You can either carry a few larger capacity magazines, or more standard capacity magazines. The choice is yours. The magazine is very high-capacity and can hold 30 rounds total. It's also built with a chrome silicon springs system that makes loading each new round into your rifle a very smooth process. Because it is larger than usual, you may be able to carry fewer magazines than you expect that one time. Despite its size, it is lightweight for the amount of ammunition that you get per magazine. Now that you have some great spare magazines for your 6.5 Creedmoor, let’s go over a few quick tips that will help you keep them in working order at all times. Magazines need to be cleaned just as guns do. When they’re empty, you should use a cleaning oil and a dry cloth to get rid of dirt and debris. 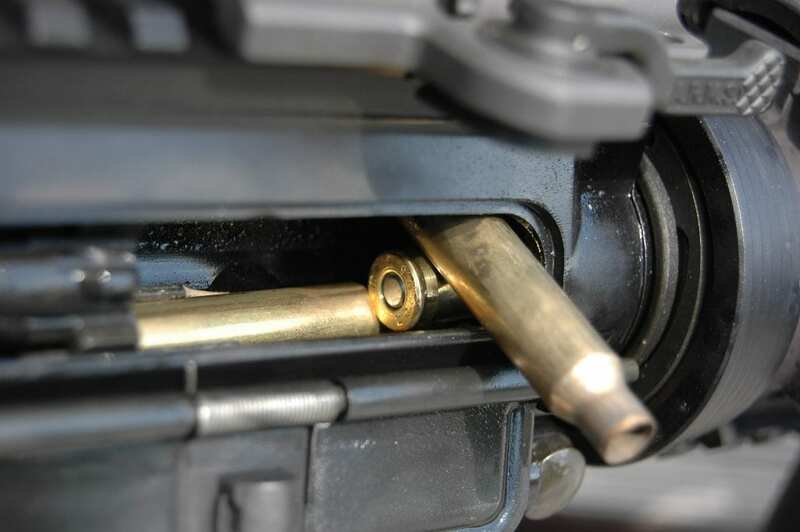 You can also use compressed air to make sure that no grit interacts with the magazine spring or the mechanisms responsible for feeding rounds into your rifle. A dirty magazine runs the risk of jamming at the worst moment. Always check out your magazines before you load them with ammunition to make sure that they’re in working order and appear to be clean. Jammed magazines that aren’t inspected can break, potentially ruining both your rifle and the magazine. Make sure that when you load ammunition into your magazines that you do so carefully and precisely. Take your time if necessary, as the magazines are designed to speed up your firing rate in the field, not before any shooting. When they’re not loaded or not in use, it’s a good idea to store your spare magazines in a dry space that doesn’t run the risk of corrosion. You should keep them in a container where dust can’t float into their interior as well. Altogether, spare magazines are one of the best purchases you can make to enhance the performance of both your 6.5 Creedmoor and your overall tactical kit. They provide many benefits and if you have the right magazines, they can last for many years and provide consistent, quality performance. Thanks for reading!